← Does Jessica Jones Need an Exorcist? Would You Give Your Child a Bullet-Proof Backpack? When I heard this interview on the radio Monday, it sapped me of Christmas spirit. I wonder if Santa brought bullet-proof backpacks to many children last week. Several public school systems across the country have introduced ALICE training — Alert, Lockdown, Inform, Counter and Evacuate – into their staff development education. And just weeks ago, students themselves were taught the ALICE program in Beaver, PA and Columbia, MO. We are teaching our students history, math, and how not to freeze if an active shooter invades the cafeteria. Could this actually be the new normal – that children will increasingly wear ballistic resistance-tested backpacks? The radio interviewer expressed some of my own reactions to the dad who gave a bullet-proof backpack to his child – who attends a Christian school in Massachusetts. Doesn’t this give a feeling of false security? (i.e. you might not be shot in the back) How do you explain to your child why he needs to wear a bullet-proof backpack? Wouldn’t this add to a child’s nightmares? Isn’t this a terribly sad way to live your life? I’ve heard people say that they carry a gun just in case. Would they actually use it in an emergency? Would they be able to reach it? What are the chances of someone threatening you so that you’d need a gun in the first place? These are the same questions I would ask parents who outfit their kids in a bullet-proof backpack. We live in a free and open culture but there are too many guns and too few mental health options. This is a theological conversation that I hope our congregations will have in the new year. Is there a place between theological naivete (God will protect my children if I pray hard enough) and theological que sera sera (Whatever happens will happen so there’s nothing I can do about it) where we can be faithful? 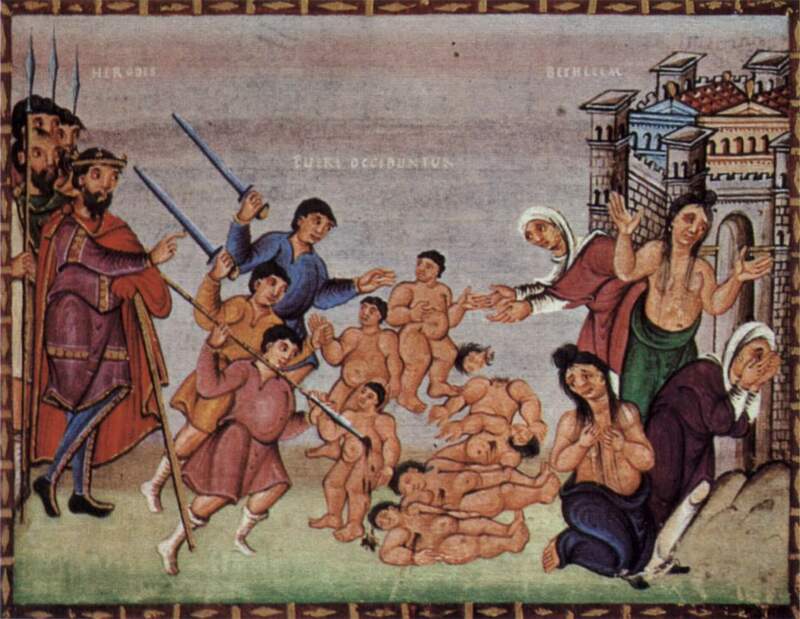 Image is The Massacre of the Innocents from a 10th Century manuscript. Jan, what a sad truth you speak so eloquently. Congregations need to be brave enough to have this conversation.